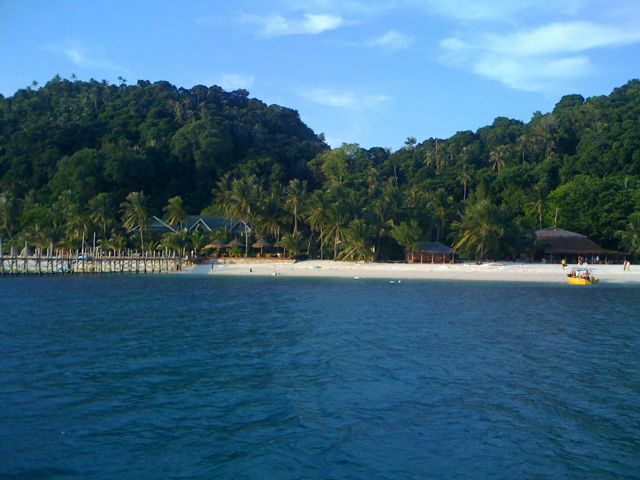 Early next morning, we set a course to Pulau Sibu. Took us the whole morning and arrive at a small resort (only saw 2 guests) around 1pm only to be told they run out of food (wth!?). We end up making lunch on the boat, instant noodles and then set off to Pulau Rawa. 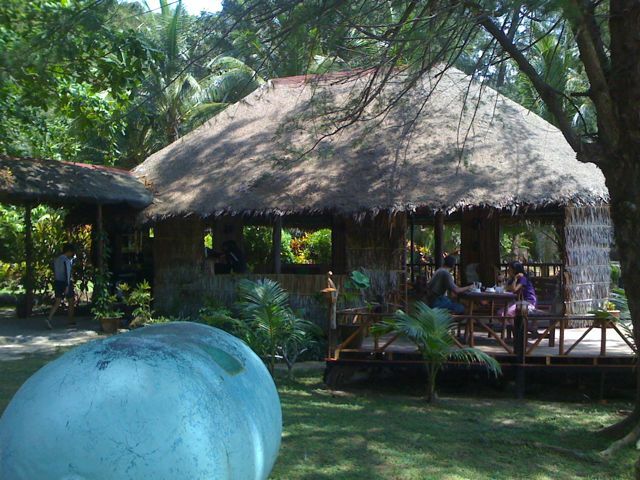 Pulau Rawa, according to friend, serves the best lime juice in the South China Sea. We arrived around 7pm at a resort filled with foreigners and their families but no lime juice. Kids are all over the places, the sand is beautiful but the corals are sadly dead. The dead corals go all the way to the shore (merely meters) and we can only imaging how beautiful it is years ago before human arrives. This is where my glasses broke into half, one half landed on the boat and the other half sink into the sea. Its not deep (5 meter water) but it is dark…and jellyfishes are all over the boat. The next morning, we made our way to Tioman. I used to see those old ships with a small platform on the top of the mast for watch out, I wonder why you need someone up there just to see ships which you can see from miles away. After this trip, I can fully appreciate the importance of watch out, and without my glasses, I am practically useless. 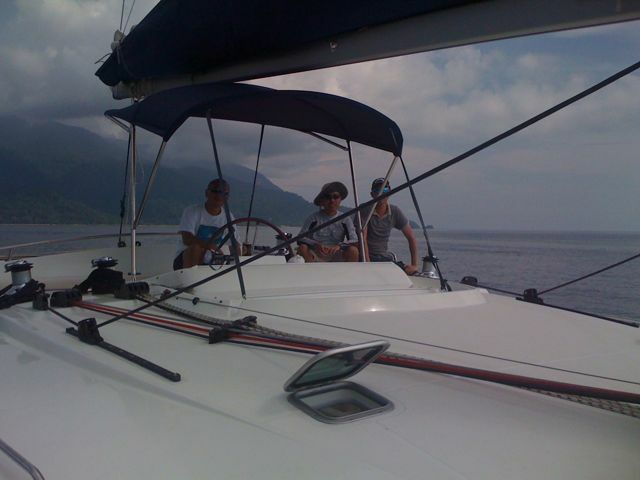 Wind was pretty bad so we made our way on engine again and arrive at Tioman around noon time. As we were doing our port clearance, another friend from Singapore, Matt the semi-retired fund manager from China also arrived in his 44 foot Catamaran. 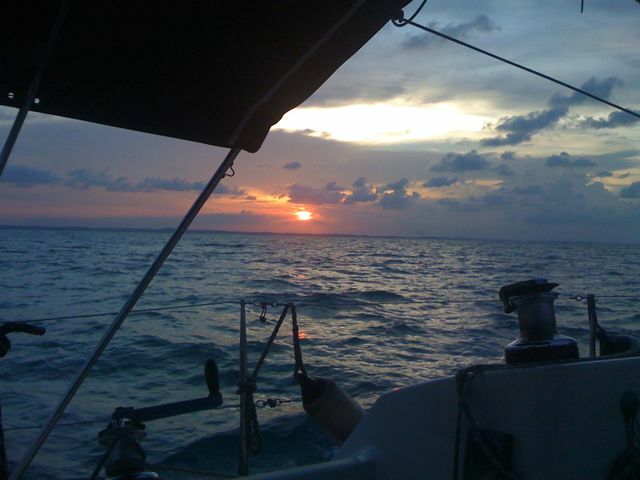 He set sail a day after us but was able to do average 8 knots compared to our miserable 5 knots. His boat is huge, living room, 3 bedrooms with full-size beds, 2 toilets and showers (!!). We spend the afternoon Island hopping around Tioman on his boat and then drinking beers at the habour of Tioman in the evening. The next morning, I become a deserter :-( I bought a ticket from Beryaja Air and fly back to Singapore while Alex & Rocky continue their way to Laut and then sailing back to Singapore together. It was lucky Rocky came along at the last minute or Alex would have problem going back to Singapore. Did not see any sharks but lots of fishes, dolphins and water. It was tiring but definitely something I love to do again. This entry was posted on Wednesday, May 28th, 2008 at 8:51 am and is filed under Travel. You can follow any responses to this entry through the RSS 2.0 feed. Responses are currently closed, but you can trackback from your own site.